I started the evening by doing something I rarely do, and then convincing my alliance mates who were online to do it with me --join a general militia fleet. We were in for a rare treat. Polska, apparently, leads what he calls a 'MACO' fleet every Monday evening, open to anyone who wants to join. He is an interesting individual, but for all his faults, cannot be called risk averse. It is the risk averse FCs I detest the most --the ones that really waste your time. You prepare too much, take too much time beating around the bush of a fight usually to end in you not getting one at all. Not this fight. Our first orders were to attack, in our thrashers, (many tech 1 fit) a tech 2/tech 3/logi gang Pandemic Legion had just brought into Auga. I, too, scratched my head at this. And, I admit that I burned my ship off gate and watched the 'fight' in horrific fascination. PL also seemed a bit confused. Imagine a well trained battalion of knights, marching through the forest in full battle regalia only to be attacked by a small mob of bunny rabbits. And, you have a pretty good idea of what the fight looked like. After wards, after the people in pods reshipped, we engaged Fweddit a couple times, first on their station in Egghelende, and then on our station in Huola. I admit, I'm not a 'fleet' girl, nor are my alliance mates. I like less organized, small-gang stuff. So, it was later when the real fun began. 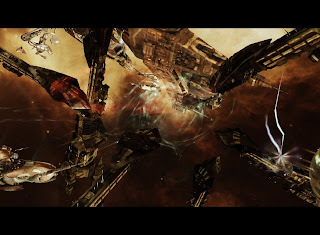 We skirmish a lot in Kamela with some of the smaller Amarr groups that live there. Sometimes, the evening is spent fighting in really tiny frigate groups with maybe no more than 4-5 on field on each side at a time. Other nights, things escalate into a larger, more organized engagement. We played around with Predator Elite's gang for at least an hour before things began to heat up. We reshipped a half dozen times, sometimes shipping down into frigates to go into a plex, or shipping up to cruisers to attack them on a gate somewhere. Things escalated a bit more when the fight moved to the Kourmonen gate, as we are not tied down with plex restrictions there. We brought some battlecruisers as did they. I can't tell you how good it was to fly a battlecruiser again! Our first major kill was a macherial, and they started coming pretty heavy after that. It was obvious they were itching for a good brawl. Not a huge fleet brawl, mind you. Both sides had a dozen pilots on field, or less. So it was going to be a good old fashioned small-gang brawl --just in bigger ships. We reshipped to battleships, BCs, and two guardians. Our scout reported that they had three guardians, and were shipping into BCs and tech 3 cruisers. "Will we even be able to break that?" We took the fight anyway, and an all out bloodbath began on the Kourmonen gate in Kamela. Someone had sensor dampeners and was able to dampen one of their guardians down to uselessness. I had some ECM drones, as did a few others, and we must have gotten some successful cycles off for their guardians couldn't keep up the reps.
We took down their harbingers first, and then switched to the Megathron. It melted into a pile of scrap metal. It was then that people started to realize we were actually doing well --we were actually breaking their tanks. Bahamut started yelling for people to get points on everything, and we started killing guardians. Two exploded, and we were so focused on pointing up Tech 3s, that the third one managed to sneak out in structure. We killed both of Predator Elite's tech 3 cruisers --his proteus and his legion. (He was dual boxing.) I think another tech 3 managed to deagress and get through the gate, and several other ships from their fleet got away. Overall, we killed 2 BCs, a BS, a Comet, 2 guardians, and 2 Tech 3 cruisers. Several billion ISK in loot dropped from the engagement. But the real kicker, was that we didn't lose a single pilot. Our two Guardian pilots were able to keep everyone up --one of them said that he didn't think anyone dropped below 80% armor at any time. It was a great fight, and even the Amarr GFed in local afterwards. There were no hot drops, no batphones, and neither side brought overwhelming force. Just a good, old fashioned small-gang brawl. Honestly, I'm not really sure how we did it without losing anyone. Something must have gone terribly wrong on their end. Or, our guardian pilots must have mad skillz. Either way, the battlereport from the evening's shenanigans (both this fight and the others) is here. Not a bad night at all. Oh man, I missed ANOTHER good one. Kuan is a sad Panda. I'm still recovering from New Years. Ask Fluffers about it.